PDC Healthcare offers the largest selection of companion labels designed to work with laser and thermal printers. Companion Labels support text, bar codes, and graphics and are the perfect choice for applying patient information onto the surface of a wristband or medical chart as used with medication administration and specimen identification. All PDC Healthcare companion labels are latex and phthalate-free. Laser Printable Companion Labels are simple to implement as laser printers are traditionally found throughout a hospital. Facilities can easily incorporate companion labels into the laser printing process at admissions, emergency room, outpatient surgery, and on nursing floors. Choose from a variety of colors in portrait or landscape orientations, and styles including hole punched, pattern adhesive, and tamper-evident. Thermal Printable Companion labels are the perfect choice for facilities opting to print with thermal bar code printers. A thermal label is made of a synthetic material and coated with a varnish making them the most durable companion labels available. 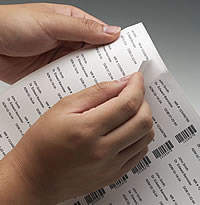 Additionally, thermal printers generate a crisp, clear image making them ideal for printing barcodes, graphics and text. Our Companion Labels meet applicable National Patient Safety Goals of The Joint Commission and other regulatory guidelines. For more information, see our Patient Safety page.